It can be found in 4 out of 5 American households, yet the ingredients in the household staple are known only to a handful of people across the globe — that’s why WD-40® Company pulled out all the stops today enlisting the help of an armored vehicle and top-notch security to move its secret formula to a secure bank vault. 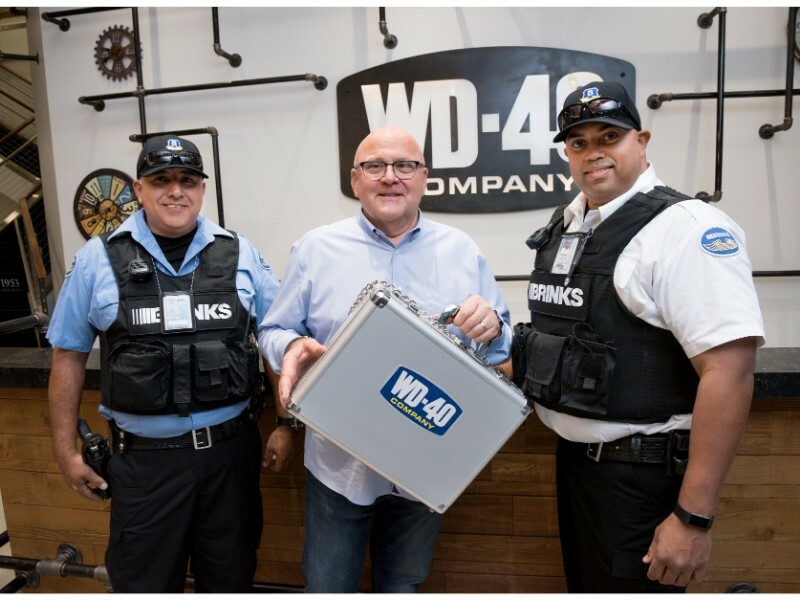 Starting at the WD-40® Company office in San Diego, President and CEO of WD-40® Company Garry Ridge entrusted Brink’s, the global leader in secure logistics, to transport him handcuffed to a briefcase carrying the secret formula, which will be housed safely at a nearby bank vault. The formula – which hasn’t been touched by human hands in more than 15 years since the Company’s 50th anniversary – is the Company’s prized possession, filling iconic blue and yellow cans in 176 countries and territories worldwide. And while the “secret sauce” has had the same basic ingredients since the Company’s inception 65 years ago, WD-40® Company is anything but static. Innovation has been a constant and has helped WD-40® Company reach net sales of $381 million in fiscal year 2017. 2005: WD-40® Company introduced the permanently attached WD-40® Smart Straw® that sprays two ways – as a wide-spray or stream. 2009: WD-40® Trigger Pro, a durable non-aerosol bottle that delivers the same great product, was brought to market. grown to 15 products including the WD-40® SpecialistTM Automotive maintenance products. 2012: WD-40® Company launched WD-40® BIKE, a high-performance bike maintenance product line developed for riders who love keeping their ride in top condition. 2015: WD-40® Company introduced WD-40® EZ-REACHTM, which has the only straw that bends and keeps its shape to make it ‘EZ’-er to get around corners and into hard-to-reach spots. In addition to the Company’s focus on innovation to meet marketplace demands, Ridge attributes WD-40® Company’s continued success to its people. WD-40® Company is a global marketing organization dedicated to creating positive lasting memories by developing and selling products that solve problems in workshops, factories and homes around the world. The American Company is the maker of the widely trusted WD-40® Multi-Use Product, an essential in every toolbox and household worldwide widely known to be the quick-fix solution to clean and protect, loosen rusted parts, drive out moisture, free sticky mechanism and stop squeaks. Maintenance professionals and DIY amateurs alike find diverse applications for WD-40® Multi-Use Product in their works with hardware, industrial, automotive, cycling, sporting and mass retail goods. WD-40® Multi-Use Product is available in a variety of sizes, and has expanded into a new range of specialized products – WD-40® SpecialistTM, WD-40® BIKE and WD-40® SpecialistTM Automotive. WD-40® Company products are currently available in more than 176 countries and territories worldwide including Malaysia where WD-40® Company’s range of products are found in major retail and hardware supply stores across all states. For more information about WD-40® Company or its range of products, visit: www.wd40.asia.